A tepid 3 stars for this third installment in The Malazan Empire series, and that because I’m hopelessly enspelled by the Imperial Warren. 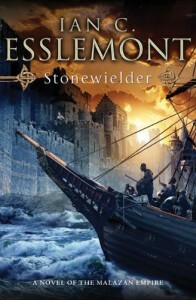 It’s not that Esslemont is a bad writer – in the right context, he’s quite readable – it’s that the sprawling, multi-POV format that the series has taken doesn’t play up to his strengths. The series has lost its focus. A problem that, in hindsight, was becoming apparent in [b:Return of The Crimson Guard|2485836|Return of The Crimson Guard (Malazan Empire, #2)|Ian C. Esslemont|http://ecx.images-amazon.com/images/I/51VrmFGek9L._SL75_.jpg|2493041]. There, however, the story could revolve around the civil war and the return of the Guard, and the characters were more interesting. In Stonewielder, we shift the story to Korel and the second Malazan invasion. The most interesting characters from RotCG get short shrift (e.g., Kyle, Rillish and Greymane), and we meet an entirely new cast, none of whom were unique or particularly interesting IMO (e.g., Suth, Ivanr and Bakune). The lack of focus also contributed to a lack of energy. The story dragged in too many places; I would shift restlessly (unconscionably disturbing the cats napping in my lap), hoping that this section didn’t go on for too many more pages. And I kept getting dragged out of the story by the inelegant prose. [b:Night of Knives|458394|Night of Knives (Malazan Empire, #1)|Ian C. Esslemont|http://ecx.images-amazon.com/images/I/51o3Va9ZSsL._SL75_.jpg|446887] is still the best novel in the series. There, Esslemont focused on two people – Kiska and Temper – and his talent was shown to better effect because he could take the time to develop his characters and their stories.